National broadcaster Stratos Television will screen what is believed to be the world’s first current affairs programme based on a forecasting system operated by the commercial arm of Victoria University. The programme “iPredict Election 2011” will screen every weeknight from Monday October 31 leading up to the general election on November 26th. Hosted by Martyn “Bomber” Bradbury, a rotating team of panellists, including NBR’s Matthew Hooton, Scoop’s Selwyn Manning, blogger Phoebe Fletcher, interest.co.nz’s Bernard Hickey, Commentator Chris Trotter, Labour’s David Cunliffe, National’s Simon Bridges, Green's Gareth Hughes, Labour's Jacinda Ardern, Conservative Party's Colin Craig, Green's Russell Norman and Metiria Turei, United Future's Peter Dunne, Mana’s Hone Harawira and New Zealand First’s Winston Peters will debate and discuss key election issues using the daily predictions from the iPredict website. iPredict was established shortly before the 2008 General Election as a market-based political and proved to be more accurate than 15 of the 19 polls published in the run up to the election. Since inventing prediction markets in 1988, the University of Iowa has successfully predicted every US Presidential race. 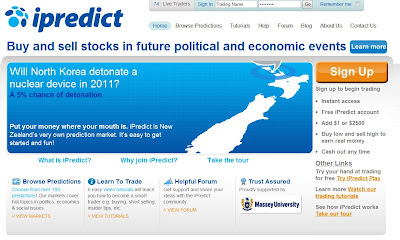 iPredict and similar markets work based on the theory of “the wisdom of crowds” which says that a large number of people making individual judgments on future events will prove more accurate than any individual. The producers believe what makes iPredict predictions so accurate, compared with traditional polls, is the growing number of homes that no longer have landlines, preferring to turn to internet and mobile phone for communications. This means there is a large chunk of voter opinion that is under-represented in polls. Instead participants in the iPredict process can visit the iPredict website to invest in favour or against possible outcomes. This has proven to be a very reliable way of predicting outcomes of all kinds. “iPredict Election 2011” will screen for four weeks from Monday October 31st at 7.00pm on Stratos Television and will be repeated the following morning on Triangle Television at 11.30am Tuesday to Friday and 11.00am on Saturdays. "Instead participants in the iPredict process can visit the iPredict website to invest in favour or against possible outcomes." so the commentary will be on where people are indicating support by placing bets (investing)?